15 influencers weigh in on the company’s 15th birthday. In 15 years, Facebook has done a lot of good — but it’s also caused a lot of problems. 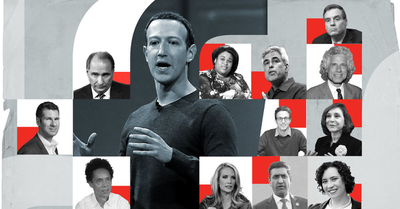 We asked a cross section of influencers, including @Gladwell, @davidaxelrod, @DanaPerino, and more to answer the question: Has Facebook been good or bad for humanity? Interesting to see Pinker & Haidt disagree so much on this. ~@JonHaidt: "I predict that by 2030 we will see the spectacular political collapse or geographical division of more than one Western democracy that seemed rock solid on the day Facebook was founded, 15 years ago." It's Facebook's 15th birthday! So we asked 15 influencers from the worlds of media, tech, politics and academia to answer one question: Has Facebook been a net positive or net negative for humanity? Here are their answers. 15 years in, has Facebook been good for the world? Imagine how much sunnier these answers would've been even three years ago. “Who would care about me and my little life?” Now we know. I'm in this compilation, but I'm sharing (again) to say that you should go and read @sapinker's take instead of mine. It's about as clear and succinct a rundown on FB's impact, judging both from history and empirical research, as you'll find anywhere. Facebook is a reminder that technology moves much faster than culture and politics, and typically upends both. Thanks to @sapinker @JonHaidt @Gladwell @peterwsinger @merbroussard @RoKhanna and others for contributing to this. My answer: Who the hell knows if Facebook is net good or bad? What's telling a cute story and weaving it into my confirmation bias going to prove? No one can evaluate a claim like this. It's not even important. Avoiding catastrophe is what's important. Gladwell wishes Zuckerberg was interested in "perpetuating a free society," like 1930s press baron Lord Beaverbrook who courted UK govt. Doesn't mention Beaverbrook directing his papers to support appeasement.